Scientists have developed a safer and less costly method of landmine detection using honey bees. They present extreme risks to humans and the sniffer dogs that accompany them. Dogs require time-consuming training and work less effectively with handlers other than their masters. It would take around 450 years using current methods to neutralize all hidden landmines. Traditional landmine detection methods are very expensive. Bees are too light to detonate mines. Bees don’t favour any particular master. Conditioning takes only a couple of days. Local bee keepers are provided with additional employment. Encouraging bees to visit helps to reestablish agricultural systems in war-torn regions, as approximately 80% of crops depend on them for pollination. 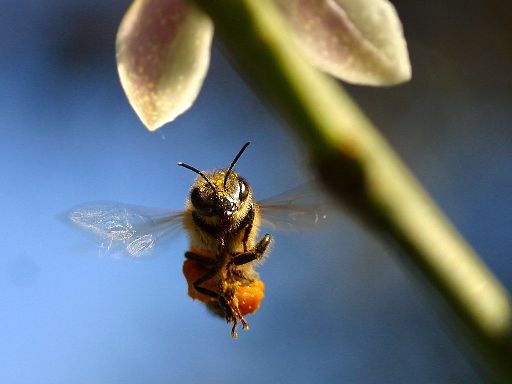 Bees have an acute sense of smell, which enables them to find food. Taking advantage of this trait, a group of scientists, led by Jerry Bromenshenk and Joseph Shaw, have conditioned bees to interpret the scent of chemicals used in explosives as food. The association is established by adding traces of explosive by-products to bee feed. Once the bees have been conditioned, the hungry swarm is let loose and tracked using lidar, a type of remote sensing that uses laser light. This technique is similar to sonar, which uses sound, and radar, which uses radio waves for tracking purposes. Bees won’t fly during bad weather, in very cold temperatures, or at night. Lidar only works effectively on flat landscapes. In Columbia, there are over 100,000 hidden landmines. These landmines claimed 1,108 victims in 2006 alone, nearly a quarter of whom died from the injuries they sustained. Columbian police had been using rats to sniff out hidden landmines, as the rodents have an excellent sense of smell (their detection rate is 96%) and are light enough that they don’t set off the explosives. However, those working with the rats encountered a serious problem – the effectiveness of the trained rats was reduced by their fear of predation. The landmine detecting rats were taught to freeze when they encountered a mine, but the rodents were too afraid of attack to stand still. To make them less fearful of common predators, police began pairing them with friendly cats. The cats wear claw shields, and the unlikely pairs play together and establish friendships, reducing the rats’ fear of predation. For more information about bees, see the main Bees page. Associated Press. (24 July 2007). “Rats, Cats Work Together to Sniff Out Landmines.” MSNBC.MSN.com. Bromenshenk, J.J., et al. (2003). “Can Honey Bees Assist in Area Reduction and Landmine Detection?” Research, Development and Technology in Mine Action, 7.3. Mine Action Information Center, MAIC.jmu.edu. Gerstner, E. (4 August 2005). “Research Highlights: Lasers, Landmines and Honeybees.” Nature Physics, Nature.com. Helm, B. (16 August 2005). “Finding Land Mines by Following a Bee.” Business Week, BusinessWeek.com.